Keeping a record of all the wanton noodles I have eaten! I’m an insane chilli lover, prefer prawn-pork boiled silky wantons that are chunky, with a good portion of tasty egg noodles in chilli/savoury sauce accompanied with fresh pickled green chilli and crispy pork lard. 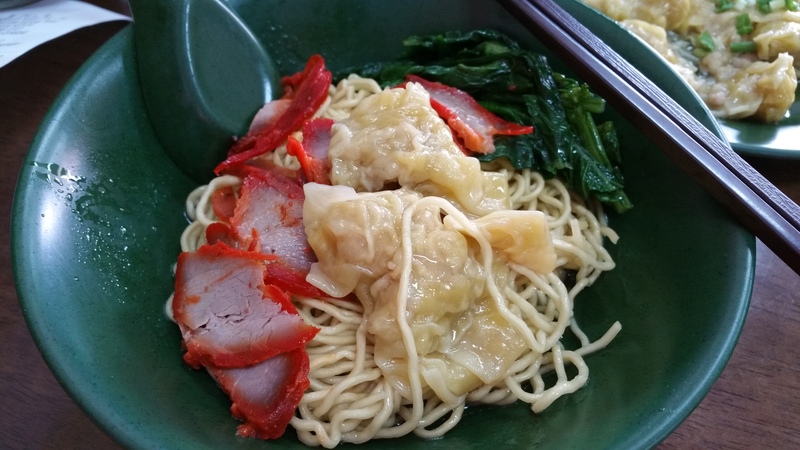 I am not interested in char siew and hence for all the wanton noodles I order, I ask for pure wantons. 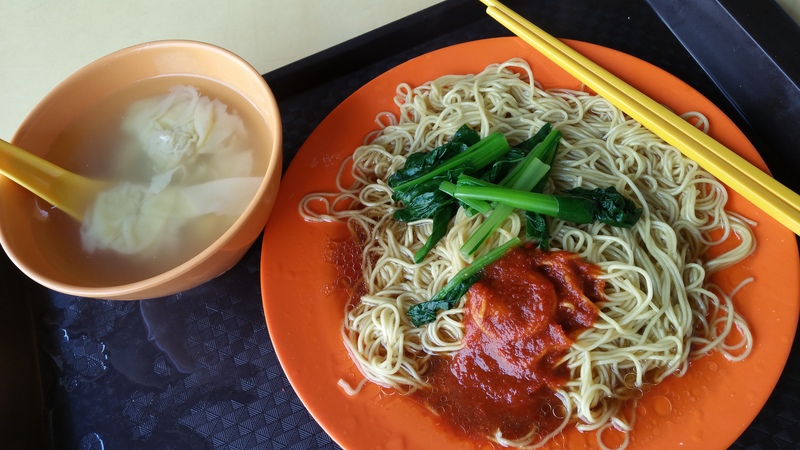 This makes comparison between wanton noodles fairer. 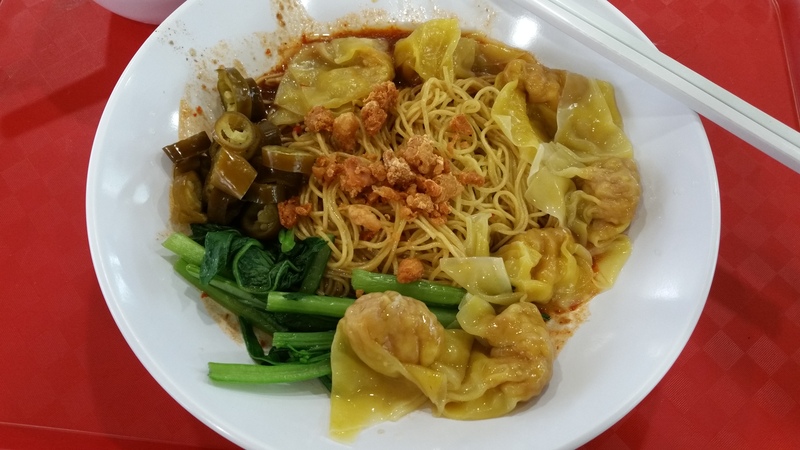 $6.40 for five big succulent wantons but what is good is their springy noodles accompanied with their special sambal chilli. A pity the noodles have that alkaline taste. Other than that, a generous portion of vegetables and noodles are springy. 630 Bedok Reservoir Road. #01-15. Singapore 470630. $2.50 for a generous portion of big wantons. Bedok Market Place, 348 Simpang Bedok, Singapore 469560. 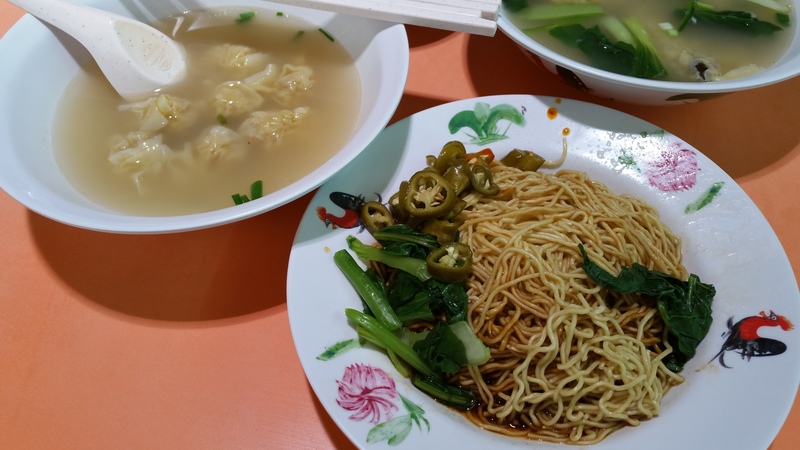 $5 for twelve pieces of big wantons with a big serving of noodles and self-help to the fresh green chilli and pork lard. $4.50. The noodles are mixed in a special sauce made from pork bones and lard which really appeals to those who likes the old traditional flavours. There is a mini counter that you can take green chilli and deep fried pork lard from. But I found the pork lard not very fresh anymore. Probably due to mass production. The famous killer chilli in a squeeze bottle on every table seemed to have toned down too much to cater to the mass. A disappointment as it is not that hot anymore. The wantons on my visit today were super disappointing as they were dry and stuck on to one another, indicating they may have been cooked long ago and being left to the open air for too long. 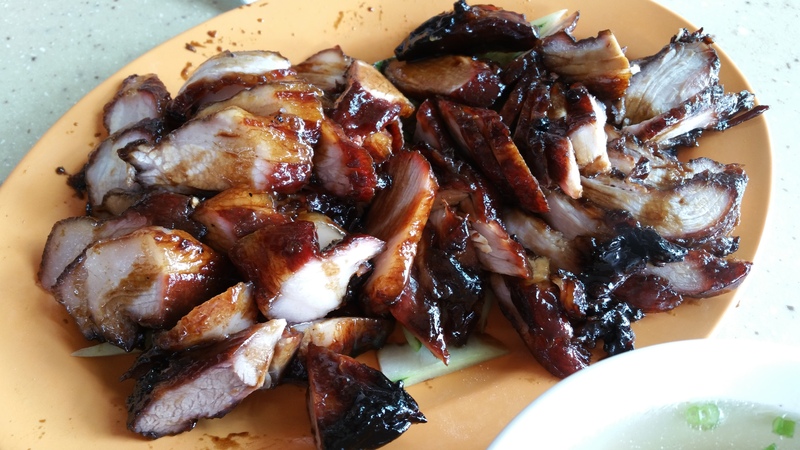 Char siew were dry and had no fragrance from its grill. 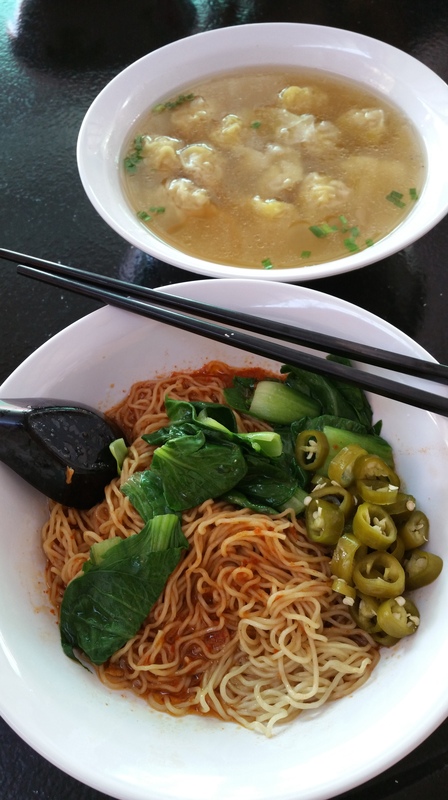 Being my favourite wanton mee, I will probably give it another chance. 6. Chang Cheng Mee Wah 長城美華 Food Court and Coffee Shop. Block 406 Tampines St. 41. $3 for six pieces of wantons. Noodles have a slight alkaline taste. 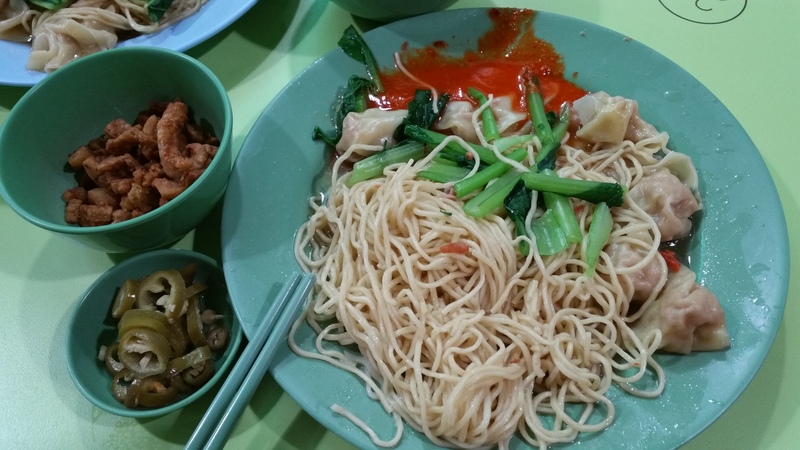 Wantons are just ok.
271 Onan Road Dunman Food Centre #02-19 Singapore 424768. $3 for six pieces of wantons. 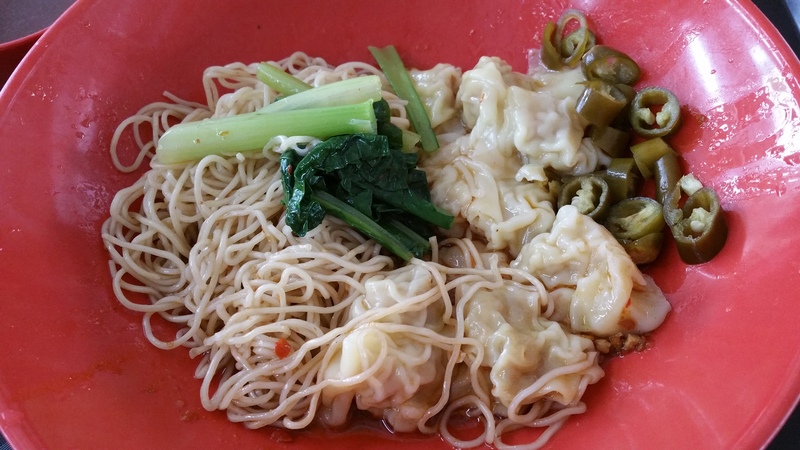 Don’t judge a wanton mee by its looks. This is awesome, better than Eng’s! The chilli is more spicy than Eng’s. The wanton is more flavourful and succulent than Eng’s. The deep fried pork lard is given upon request and tasted more fresh than Eng’s. Green chilli is fresh! 8. 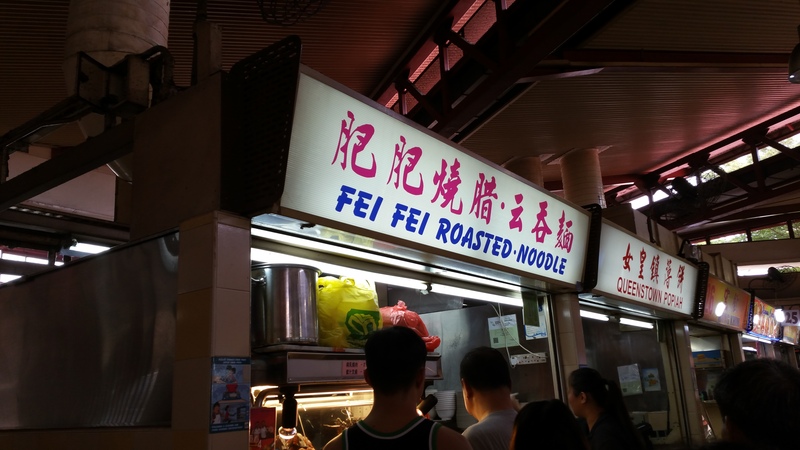 Fei Fei Roasted Noodle 肥肥烧腊云吞面. $3. Usually sold out by 12pm. Impressive charsiew, next best to my mum’s. Springy noodles without the alkaline taste at all. The stallholder said after every n bowls of noodles, he will have to change the water. Wantons are huge with a full solid prawn inside. Very tasty! Green chillies are fresh! 176 Orchard Road Centrepoint. #B1-61/63. $6.90++ for four big prawn wantons. Really really small bowl but succulent tangy prawn wantons. The egg noodles are springy and broth is light and not too salty. The red chilli sauce is nice but I felt it doesn’t really go well with the noodles. 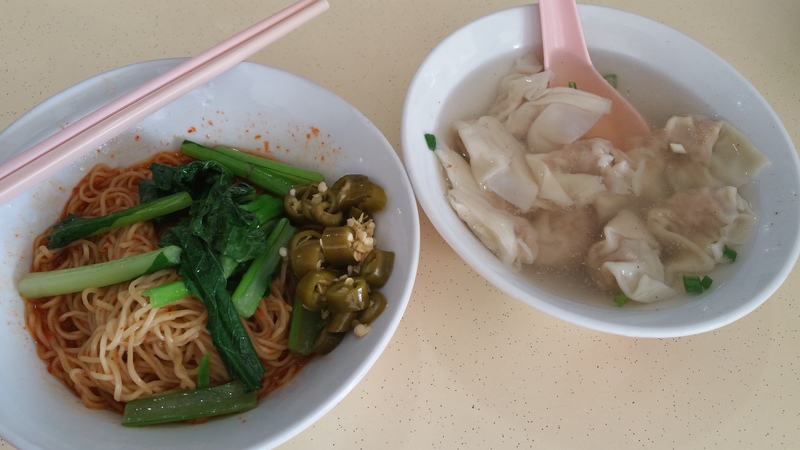 The texture of the noodles and wantons are really good but I still prefer local version of wanton mee. So much for the hype. So came at super off-peak hours to beat the queue. Will I queue for this? Nope. 10. 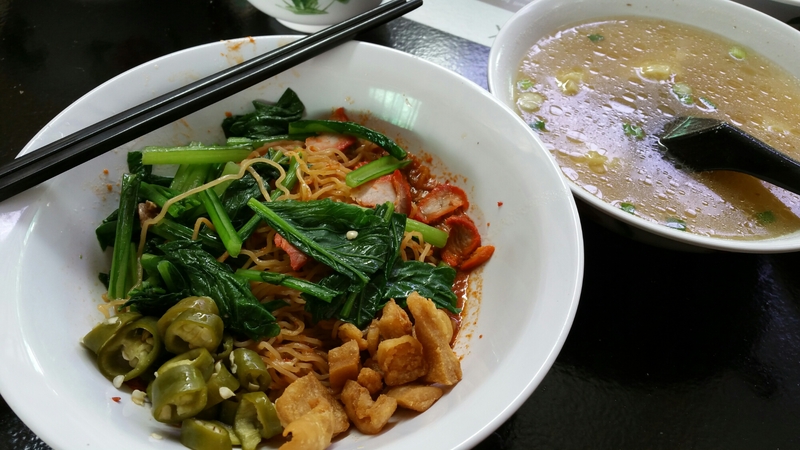 FeiFei Wanton Noodles 飞飞云吞面. $4.50. This was the second worst so far that I’ve eaten. 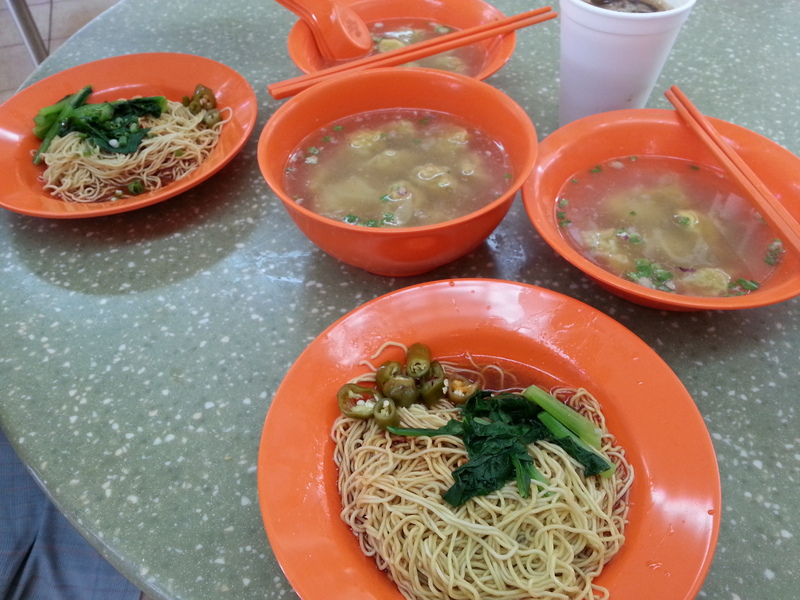 The worst was Pontian Wanton Mee. For this, the noodles are dry, the sauces just not enough to coat the noodles, the wantons are small and filled with under-seasoned minced pork, the wantons skins were too soft (overcooked?) and seriously in lack of character. $4 for ten pieces of wantons. Wanton fillings are pure minced pork and tasted quite good. Quite tasty noodles. Friendly stall holders. Eating this cos’ Kok Kee was sold-out. 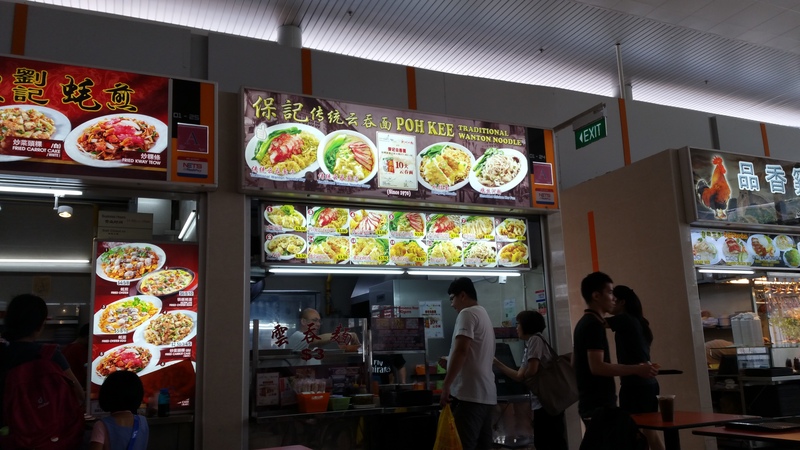 There are five wanton mee stalls in this food centre. 12. Good morning! Back here for marketing around our familiar neighbourhood. Miss staying around here. Xing Ji 星记. 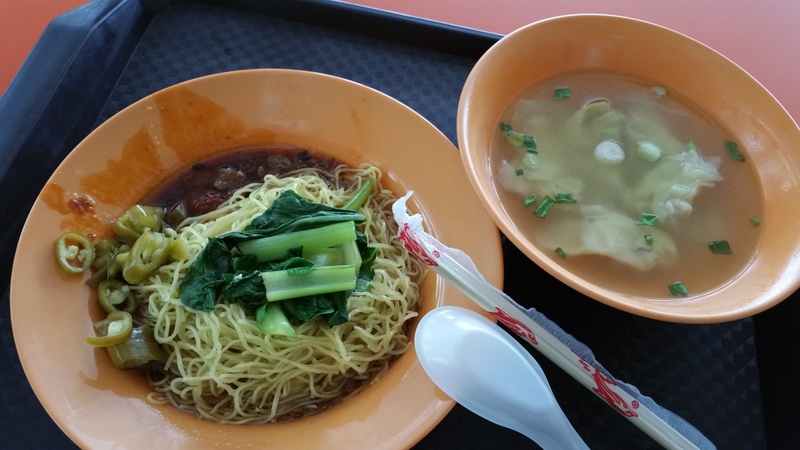 Blk 137 Tampines Street 11 (Round Market) #01-35. Long long queue. $4 for ten pieces of wanton. Noodles slightly little. Delicious tasty wantons! It has been a long while since I last eaten here. 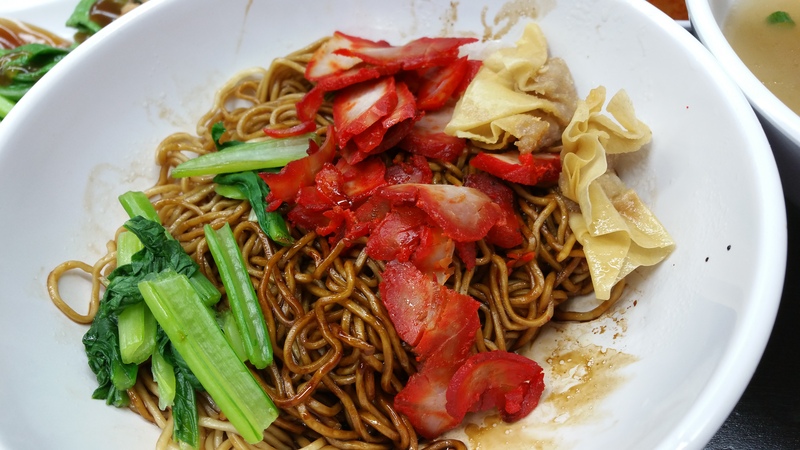 $4 for ten pieces of wantons and a generous serving of noodles. When the chilli and sauces were mixed into the noodles, it gave a real punch of chilli fragrance and dried shrimps. The pork wantons are big and every bite was happiness, not to mention that the noodles were served in my favourite blue porcelain bowl. $3 for five pieces of wanton. Noodles are mixed in a more ketchup than chilli sauce mix. Wantons are a little too porky and bland. 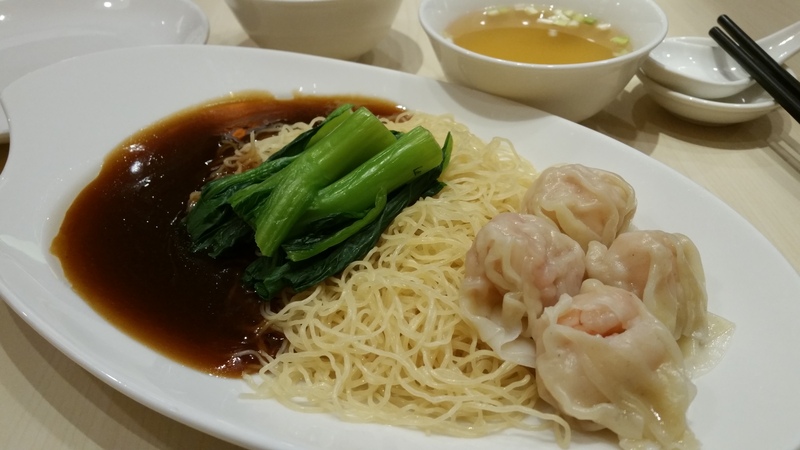 $3.50 for seven pieces of delectable succulent minced prawn-pork wantons. It tasted very familiar, something close to my mum’s taste. Can’t really find the right words to describe it. I love the wanton skins. They are soft and the meat to skin ratio is just right. The noodles are cooked in an automated noodle cooker that caught my attention. The noodles sprang up exactly in 20 seconds automatically ensuring that every bunch of noodles are cooked al dente! 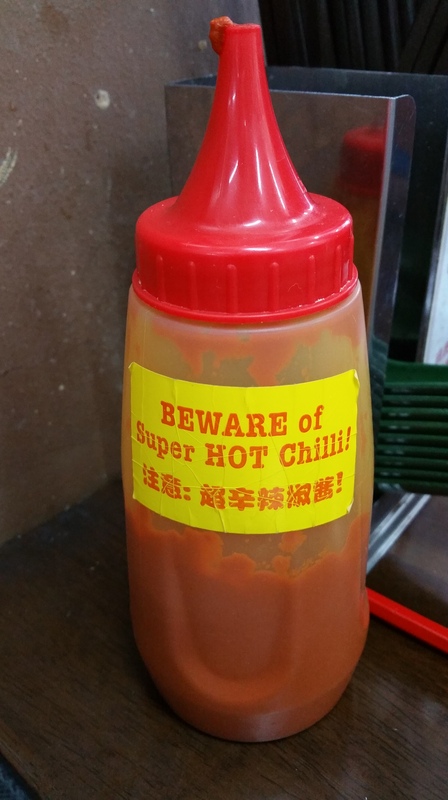 The chilli sauce is specially formulated by Roy Chan, a chemist. It was not that spicy to me but left a spicy sensation in my mouth after finishing. Add some fresh fried pork lard to enhance the taste! Opening hours: 830am to 9pm. Closed on Tuesdays. $3 for eight pieces of wanton. I was actually quite disappointed by its pale colours but the pork wantons were actually well-seasoned and the chilli sauce in the noodles was very savoury!! The noodles texture was springy and the best thing was that the noodles did not have any parts sticking together. The only area for improvement is the mediocre soup. $4 for five pieces of pork wantons. Plenty of noodles mixed in sesame oil and special sauce making the noodles more soupy than dry. If you want chilli, they will add chilli sauce onto your noodles. I found the chilli sauce more ketchup-y than tasting like chilli with that punch. The noodles are slightly more soggy than springy. The wantons are totally under-seasoned accompanied with a tasteless soup. To make it worse, they do not serve green chilli. An elderly woman sitting beside me had the char siew order. The char siew was paper-thin and she didn’t eat them. It was probably bad. It is a wonder why there are so many people queuing. To me, it is definitely not worth to queue. I am curious if the Lavendar stall is better, same or worse? $3 for eight pieces of wantons. The first bite of noodles had traces of alkaline. The chilli sauce with the noodles was not spectacular though it was of good portion. Noodles a tad too dry and chewy. Soup was of peppery taste and served piping hot! The pork wantons left a better impression. $8.80++ for 4 shrimp wantons. The noodles were too dry and the sauce too starchy. Wantons seemed to have been left to dry in the air for a while before serving as the skins were dry and broken. Soup was not too salty. 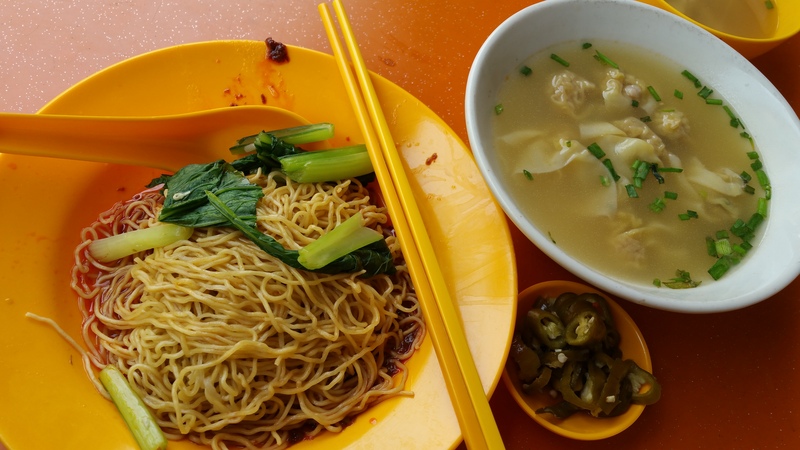 $2.50 for seven pieces of wanton and a large portion of egg noodles. Big and succulent pork wantons. Deep fried pork lard available upon request. Noodles are mixed in a savoury sauce with the fragrance of sesame oil. $9++ for four pieces of shrimp wanton. The thin egg noodles were a little dry which reminded me of the one I ate at Crystal Jade Kitchen. The shrimp dumplings were a little small. The skin was also slightly dry and I have to dip into the soup before eating. (Maybe because I like them smoother.) 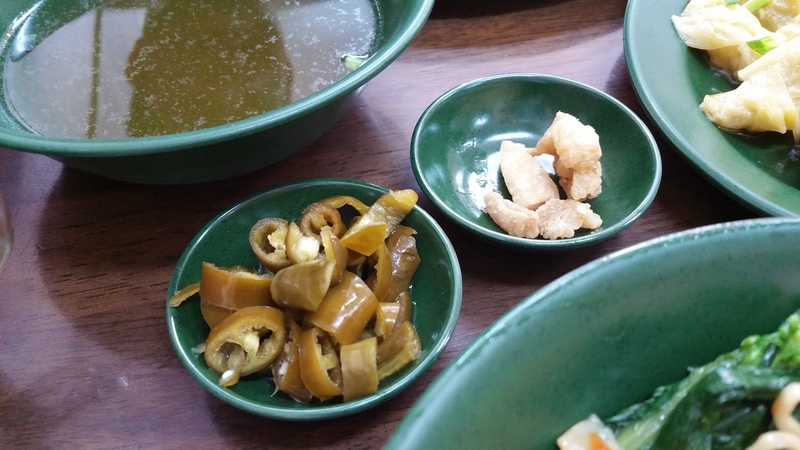 The pickled green chilli was on the sweet side which I do not like. 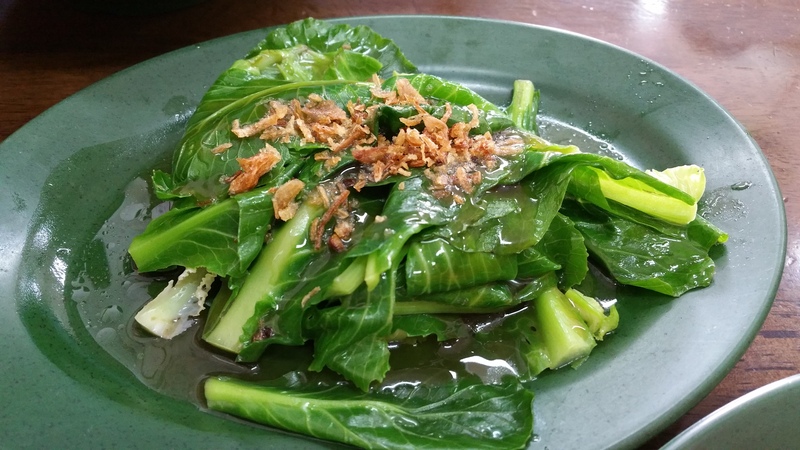 Stingy on the kailan and presentation was quite bad. Too expensive for this wanton noodles. 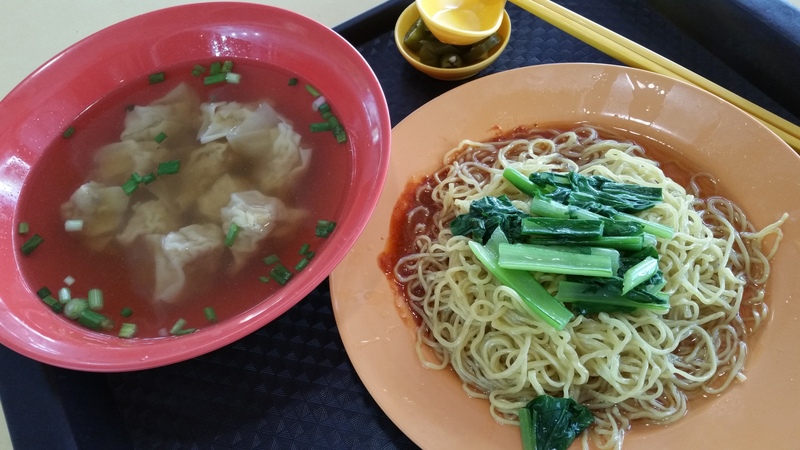 $3 for eight pieces of wanton. The sauce is more ketchup-y than savoury. The wantons didn’t seemed to be seasoned. 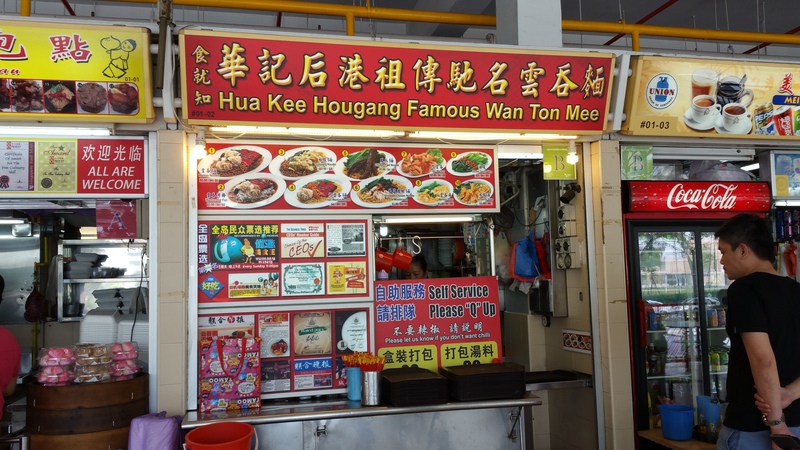 The egg noodles are hand-made and a photo at the stall indicated that they began selling in 1977. Maybe this is 1977 taste? But not suitable for my liking. $4 for twelve pieces of wantons. I didn’t order this with the kolo mee which I regretted. The sauce was not fantastic but the wantons are good! Opens from 5am to 3pm and prepare to queue for at least half an hour. $2.50 for seven wantons. Wantons were slightly small and not succulent enough. The noodles were very springy and the chilli sauce has got some punch. For every noodle order, you can add $1 for an additional seven pieces of wantons soup or three pieces of dumplings or four pieces of deep fried wantons. $3 for six pieces of wantons. The noodles are mixed in a nice fragrant lard and sesame oil sauce and they are smooth and springy. The wantons are under seasonsed. $4 for eight wantons. Wantons are succulent and flavourful! 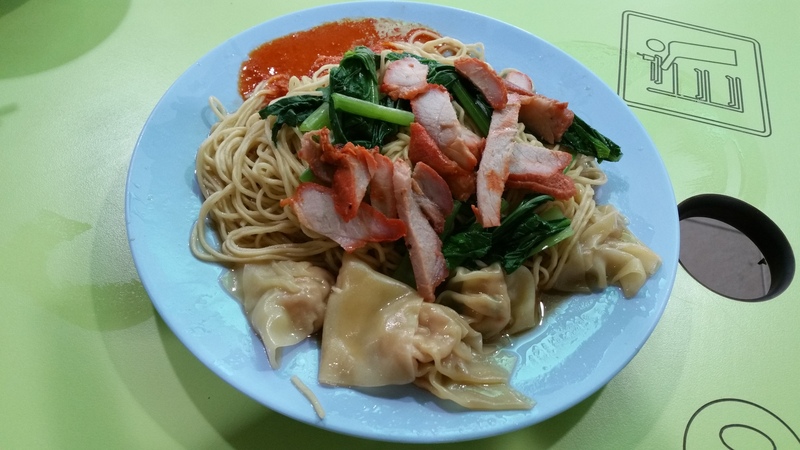 $3.50 (staff price) for eight pieces of wanton. Noodles and wantons were under-seasoned. Good thing is the noodles do not have the alkaline taste and wantons tasted fresh and meat filling was not stingy. Portion of noodles was slightly small. 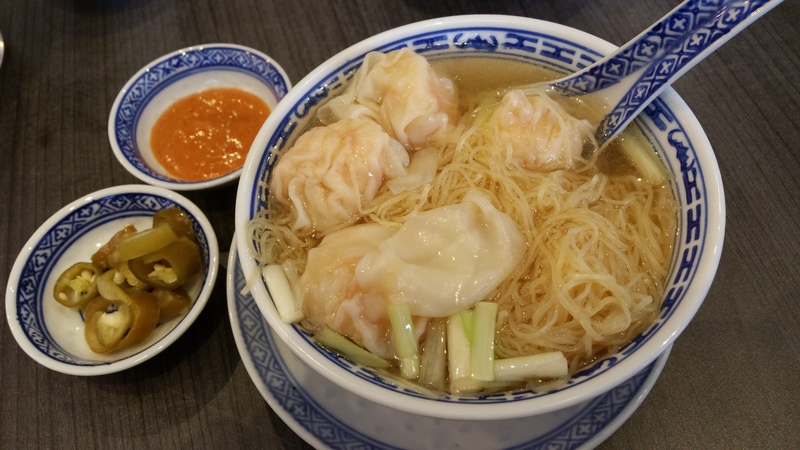 $3 for eight pieces of huge mouthful, succulent wantons. The chilli sauce has got a punch and the wantons are well-seasoned. 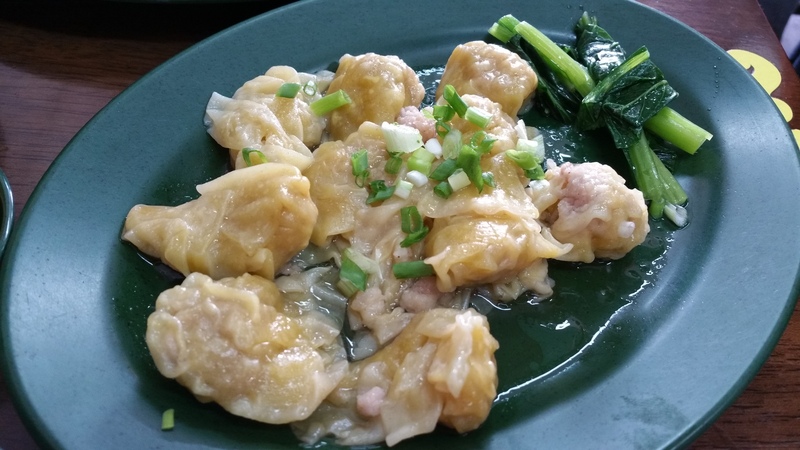 The pork wantons has got water chestnut so it gives an additional texture to each bite. 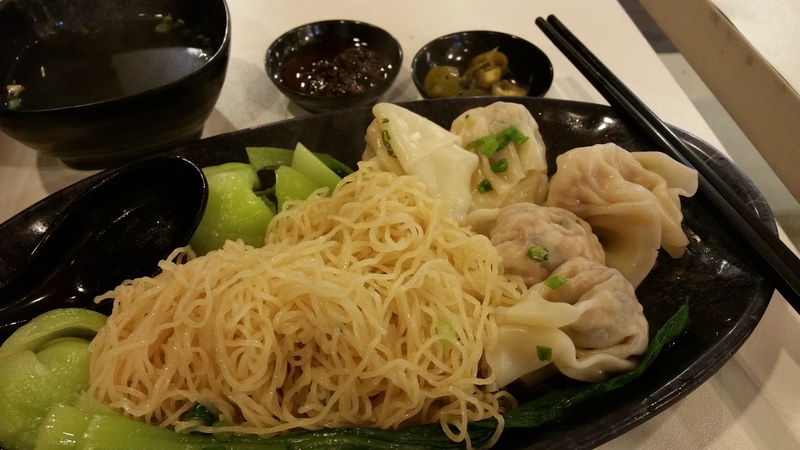 Each wanton is so big that one needs to eat one in two-three bites. 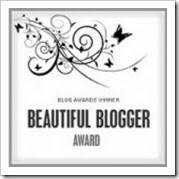 Very worthy for the price. $3 for eight pieces of minced pork wantons. The wantons are tiny and hence not of consistent flavour. Not the kind of succulent wantons that I like. 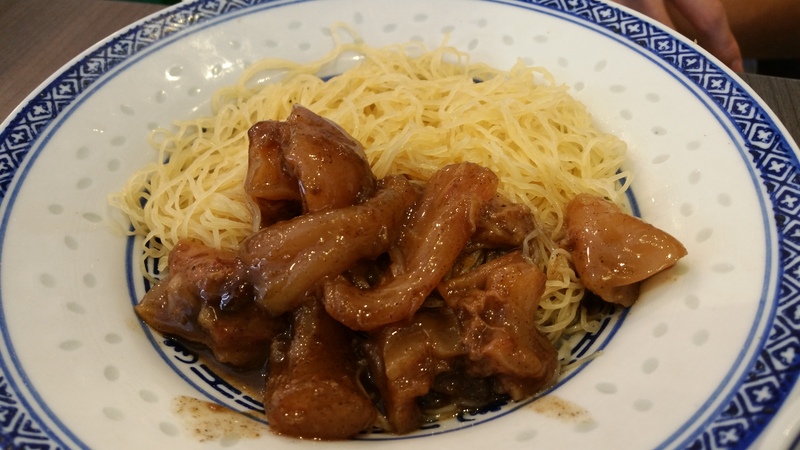 However, the braised sauce is very savoury and coated each strand of noodle perfectly. The green chilli and pork lard are both very fresh. The duration of wait is long though. 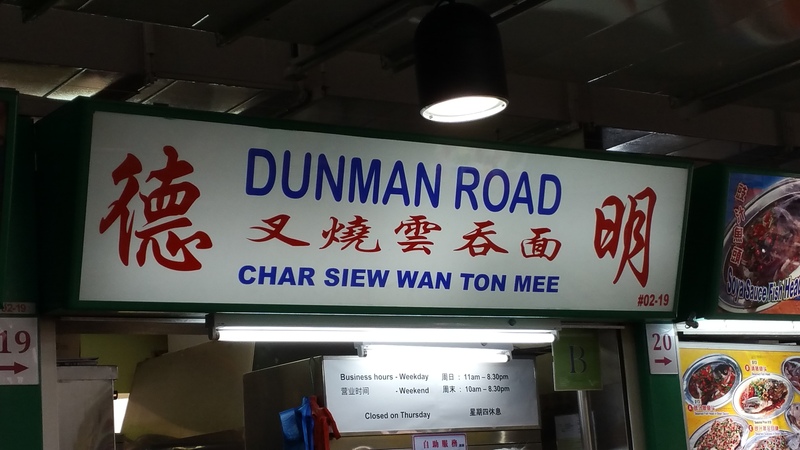 $3 for five pieces of wantons with char siew. The wantons are good but the noodles lack some punch. $3 for eight succulent wantons. The noodles are savoury. Long queue for about 20 minutes. Opens in the morning only. $4.50 for eight wantons. Wantons are succulent but lost out in terms of flavour and seasoning. The noodles were savoury but got a little too dry halfway through eating it. Soup was tasteless. $3.50 for seven porky wantons. The wantons didn’t leave any impression and soup was bland. The noodles were tossed in savoury chilli-tomato sauce that was quite nice. Green chilli was bland. Blk 216 Bedok North St 1. Hawker and Food Centre #01-45 Singapore 460216. $2.50 for six pork wantons. Add $1 for four deep-fried wantons. Wantons tastes quite ok but noodles are soggy and sauce lacks in flavour. 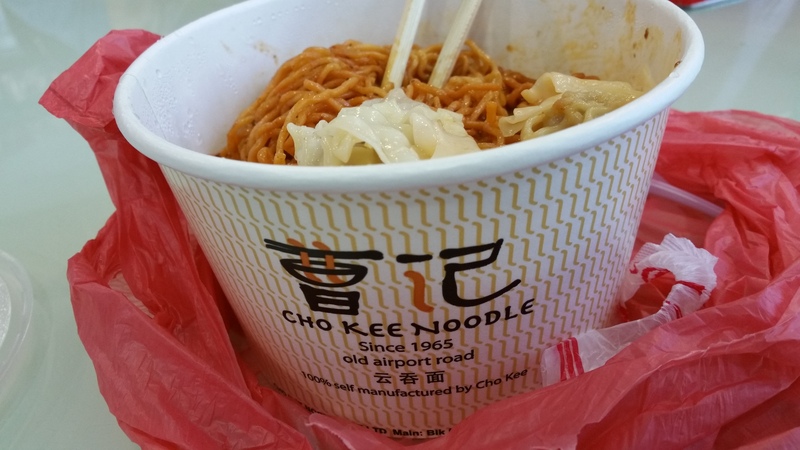 The noodles used is not the common HK noodle or the egg noodles. This one is thinner and softer. Green chilli has no taste. $3.50 for five deep fried wantons and two boiled wantons. 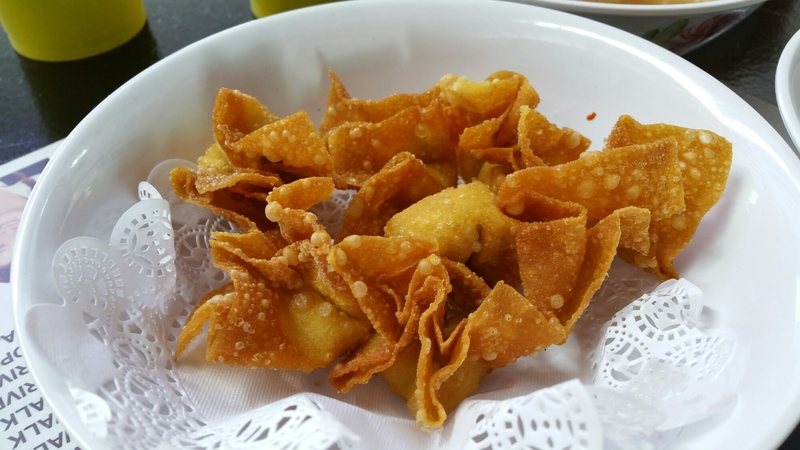 The deep fried wantons tasted as if they have been marinated with fermented beancurd. Wantons were small and the skin was hard and chewy. The taste was definitely not to my liking. However the boiled wantons tasted better as they had a different marinate. The noodles tasted more ketchup-y and the texture of the noodles was hard and inelastic. Green chilli was fresh and had been marinated well. 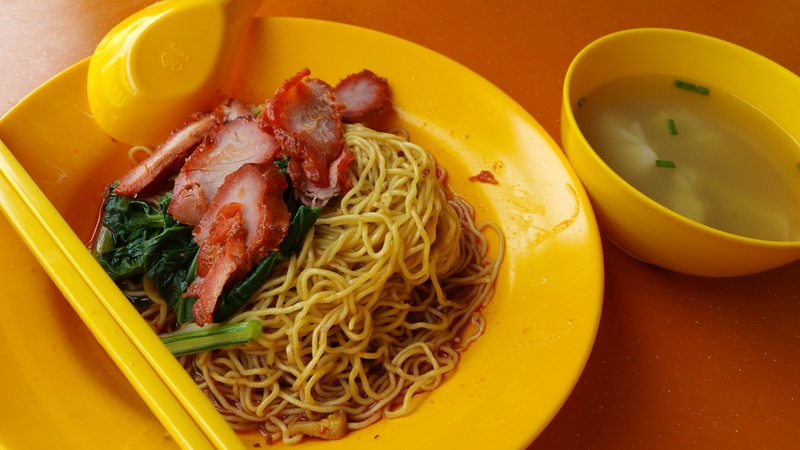 $4 for a plate of char siew with two pork wantons noodles. The char siew is probably what makes up that long queue. One can queue for AT LEAST half an hour on weekdays and an hour on weekends. We queued for an hour and twenty minutes on a Saturday morning from 945am. The queue was doubled very quickly later. The queue was slow due to the the fact that the duo had to roast char siew, slice them, make noodles, collect money and serve. The soup was ultra fishy and wantons didn’t taste good. The noodles were not tossed in the kind of savoury sauce that I like. 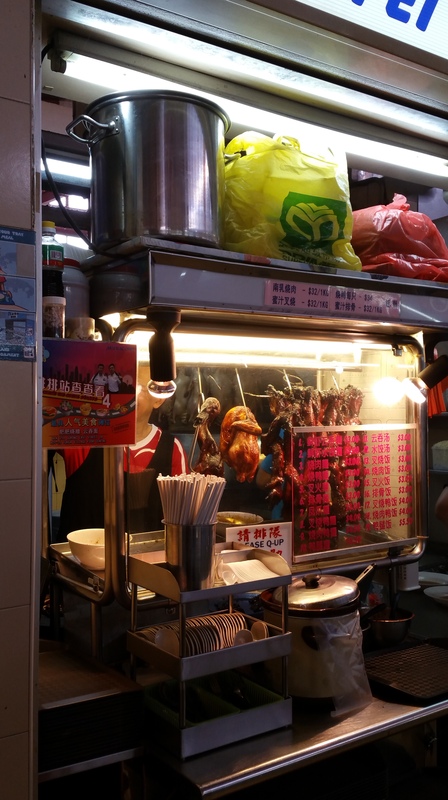 You may want to queue for their char siew which I think is second best to 肥肥’s in Jurong West, but definitely not with their wantons and mee. 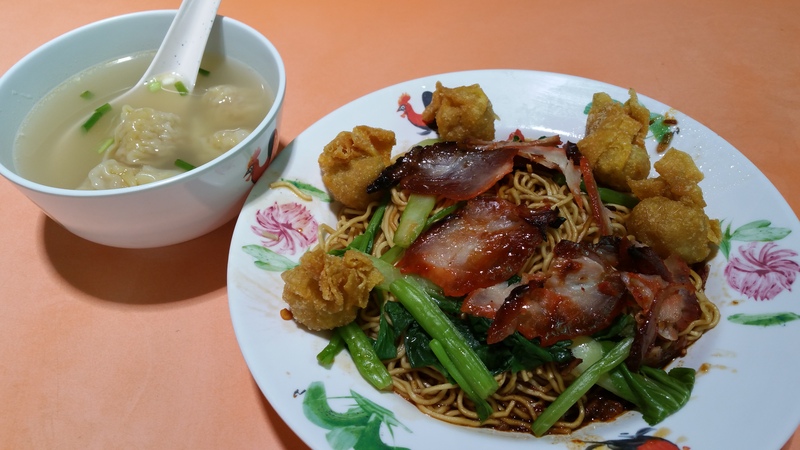 Ci Yuan Hawker Centre $2.80 for three boiled wantons, one deep fried wanton and char siew. The wantons had the same kind of taste as Pontian’s that I didn’t like. 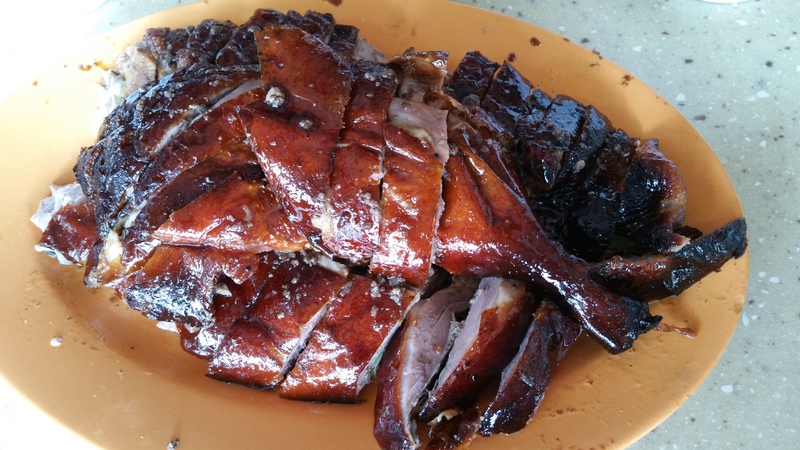 The char siew did not have the charred taste and was dry. Noodles were not flavourful too. Hawker and Food Centre #01-01. Singapore 460216. $3 for nine tasty fresh pork wantons. The noodles are tossed in a fragrant savoury spicy sauce with some pork lard. The wantons though under-seasonsed are nonetheless tasty! They do not have the smelly pork taste. 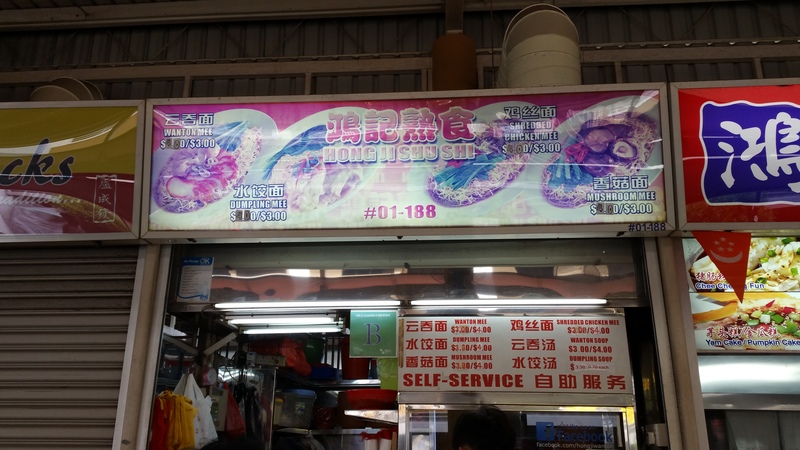 51 Old Airport Road, Hawker Centre, #01—129. 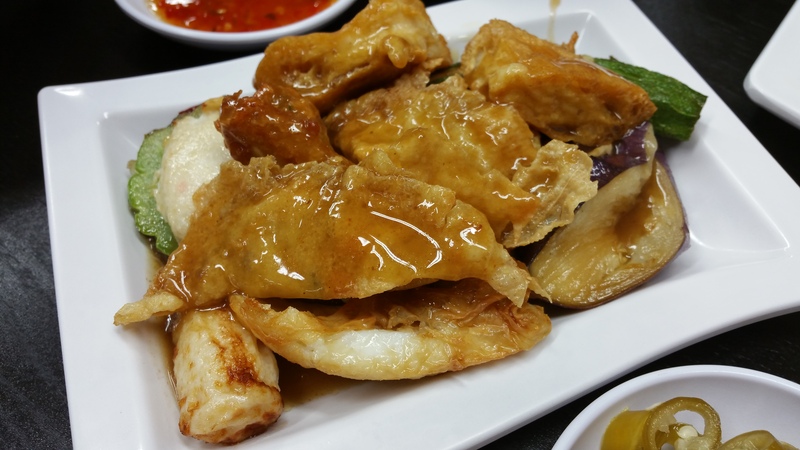 $3 for seven pork wantons infused with the woody taste from sole fish. This makes the wantons flavourful and succulent. The noodles are springy and moist from being tossed in chilli-tomato sauce. Sin Yew Huat Eating House 新友发茶室。209 Sam Leong Road. 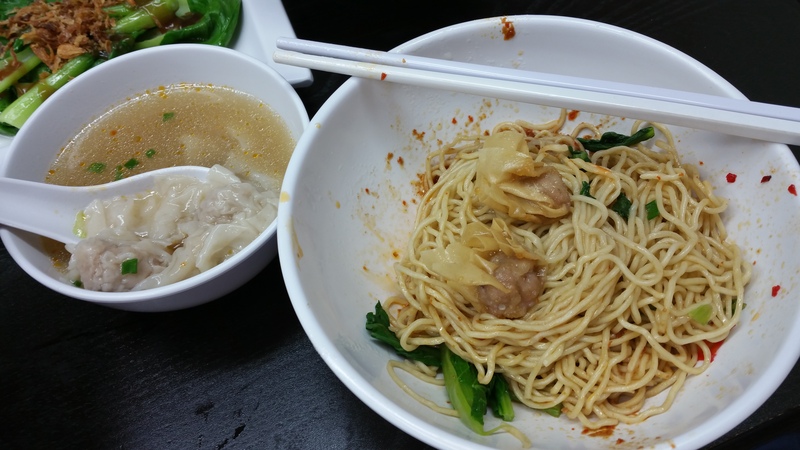 Finally got to taste this delicious wanton noodle after my second visit! It was closed on my first visit. 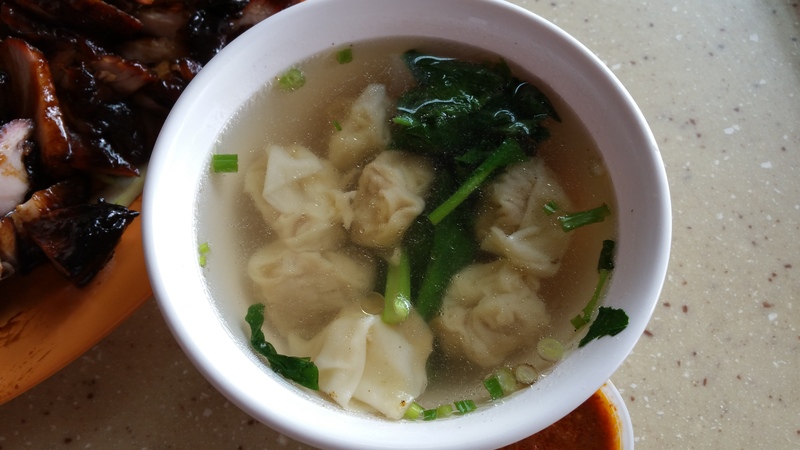 害我吃闭门梗！ $3 for ten succulent pork wantons served in a flavourful hot soup. The noodles were springy and tossed in braised sauce with chilli. It was very fragrant and delicious. A pity there were no green vegetables or pork lard. But I did like the braised sauce. It had the old school taste and was not the usual chilli-based sauce. Added $1 for six pieces of deep fried wantons. They were crispy and nothing ever goes wrong for deep fried food, right? $4.50 for five fresh meaty wantons. I finally got to eat this on my third visit here. Had a little short queue but was quite fast as auntie cooked her noodles in batches. The portion of egg noodles is small and tossed in an abundance of their special sauce that is a little sweet, not to my liking, and chilli sauce was of no punch. Good texture of the noodles though. No green chilli or pork lard. 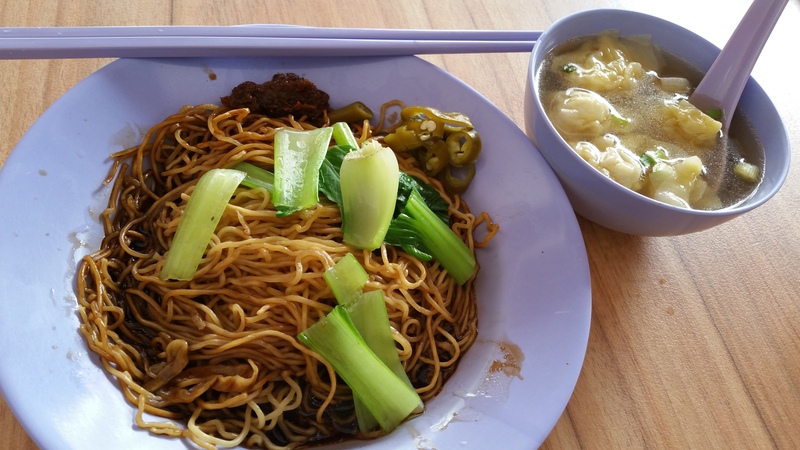 I wonder why this made it to top five of Singapore’s best wanton noodles. 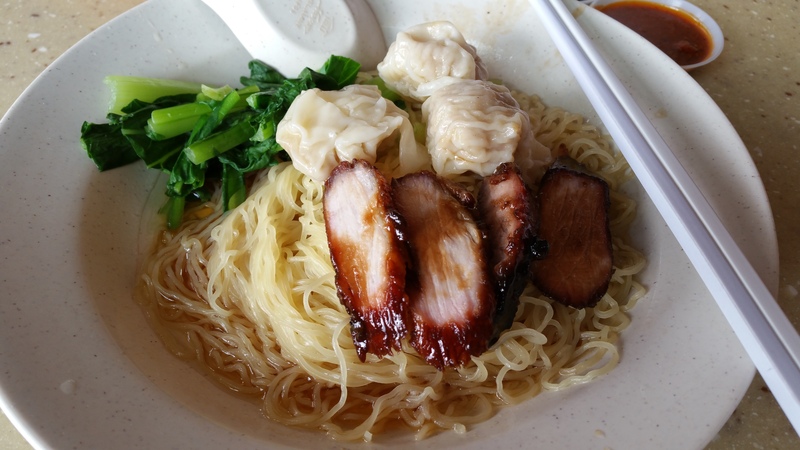 My favourite kind of wanton that I cannot find anywhere in Singapore. Why? Because the meat in the wanton in Singapore cannot be seen. Haha… ok… I meant the meat they give outside is sooooo little. And worse of all, some are fatty meat. Hence, the wanton I eat outside is basically wanton skin. 1. Minced pork with prawns. 1. Fry a piece of smashed garlic in the pot. 2. Add in washed and dried ikan bilis into the pot and fry till fragrant. 3. Add water (measure one soup bowl for one bowl, two for two and so on). Bring to boil. 5. Cook vegetables and remove from soup after cooked. 1. Season (salt, pepper, soy sauce, mushroom powder) the minced pork with prawns. Add a little corn flour in for the meat to be “smoother” and glued to each other. Give a little mix in the bowl quickly and hard to give the meat a “springy” texture later. Leave it to marinate in the chiller. 2. Add water chestnut for the crunchy feel. 3. Wrap the wanton. Put some water at the sides to glue them up. 4. 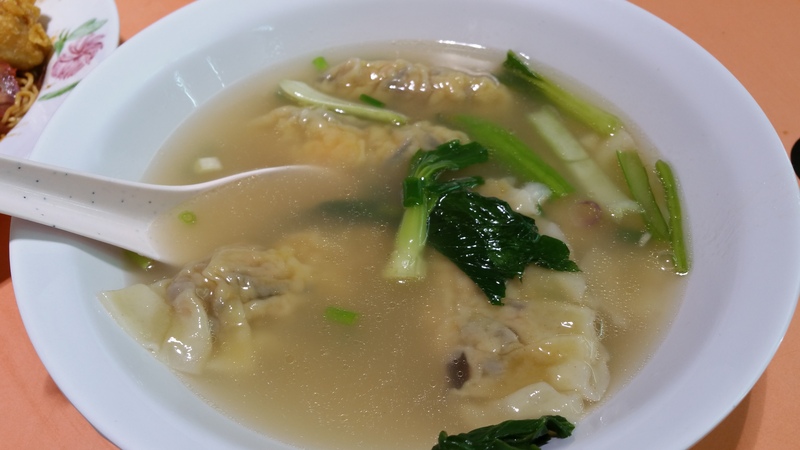 Cook wanton in soup. It will turn the soup a little yellow. If you do not want a yellow soup, cook in boiling water and then serve with soup. 5. Garnish and put pepper!